Your October Member of the Month, Jamie Denn! Don’s 58th Birthday Workout – it’s a surprise! Congrats to our October Member of the Month, Jamie Denn!! 1. How did you get started with CrossFit? What training were you involved in prior to CrossFit? After having giant twin boys, I was sure I never wanted another child and needed to get back in shape. So, I started out walking with some other moms and working out to Billy Blanks Tae Bo tapes in front of the t.v. I gradually progressed to Jillian Michaels tapes, then boot camps, sprint triathlons, Olympic triathlons, a half iron man, mud runs, half marathons and finally marathons. I loved running (especially the NY Marathon! ), but ended up with a stress fracture in my hip requiring surgery so can’t run long distances anymore. While I was recovering from surgery, a few of my boot camp friends started Crossfit and eventually convinced me to try it. That was 3 1/2 years ago and I’m still here (everyday) and love it! I especially love the varied workouts. Every day is like a box of chocolates. You never know what you’re going to get. 2. What does a day in the life of Jamie look like? I wake up around 4:50 a.m. (everyday), hit my husband Eddy in the head to wake him up, and off we go to the 5:30 a.m. class (me more often than him, as most of you know). After class, I get the kids and Eddy out the door and then me and my dogs (Major and Spinner) go off to work at my dream job. I’m lucky to be a partner in a doggie daycare here in Sudbury. I get to spend my days on a farm with 30 to 40 dogs. As much as I love Crossfit, I love my dogs. After work, I usually go for a short run in the woods with my dogs before shuttling kids from school to sporting events and then dealing with dinner, homework, laundry, and so on, and on, and on. Bedtime is usually by 9:00 p.m., so I can get up early and start all over again. 3. What is your favorite workout and why? I’m going to go with two favorite WODs. 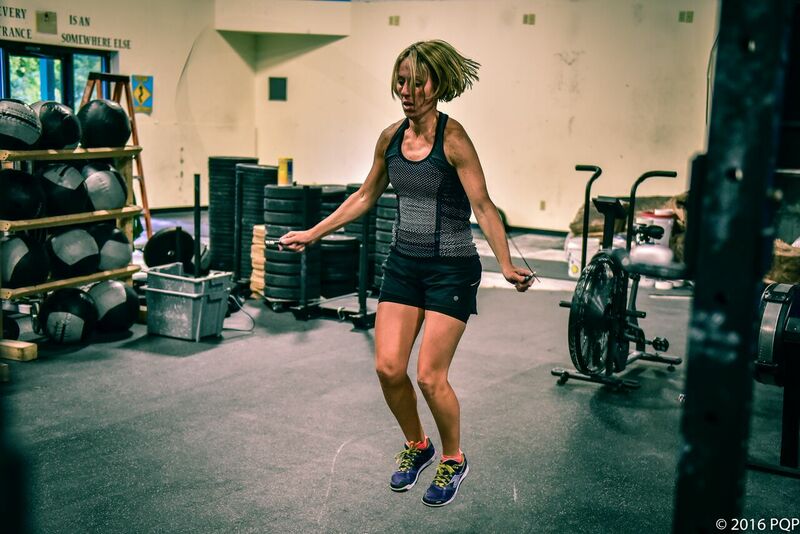 My first WOD is Nancy, because it has two movements I love — running and overhead squats. I love the challenge of trying to hold on for 15 straight squats, and I’m always glad its not 21! My second WOD is Open WOD 12.1, which is 7 minutes of max burpees. No surprise here, since everyone knows I love burpees. I am a veteran of the burpee mile, the burpee hour, and the hundred days of burpees. 4. Your favorite song comes on the stereo during a WOD? What is it? Till I Collapse, Eminem. Its a great song and it got me through 26.2 miles of the NY Marathon. 5. You are a new addition to the crayon box. What color are you and why? Funfetti. Because its happy, has all the colors in it, and I’m not very good at decisions. Would love to do this someday completely Rx! Started with the comptrain weightlifting part, moved onto Nasty Girls WOD, and then the burpee over bar conditioning part. I’m tired. Note: did UB Pullups all rounds, and UB Hang power cleans except for last round. My lowest time on burpees was 45 sec. (really not enough time in between, after minute 10 I had to rest an extra minute to finish the last two.